• long weekends just for me. i'm taking monday off which pleases me sooooooo much. • australia's biggest morning tea to raise money for cancer research. i arrived at work this morning with a big tray of the most devilishly delicious cinnamon buns (breadmachine, how i love you) and was greeted by a ridiculous spread of cakes, cookies, mini donuts, friands, bagels and peanut butter brownies! pregnant lady heaven, i tell you. • friday pub lunch to commemerate a coworker's last day. i'm sad she's leaving but man, how good is morning tea followed by free pub lunch?? • the long awaited new death cab album. loverly. • sunny, autumn days and crisp nights made cozy with slippers, quilts, dachshunds and heaters. • the baby & kids market on in camberwell this sunday. • pattern writing for the secret magazine project 85% finished with the aim to be done, finito, completeo by the end of the weekend so i can pop it all in the post on monday. what a relief that will be! Such a happy post like a breath of fresh air! Savor those days off as they will be far and few between when the little one comes. :-) But every busy moment will be amazing! 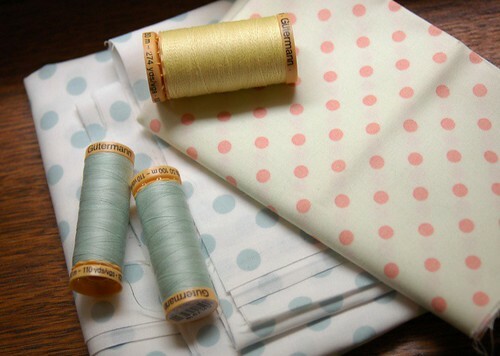 Love the cheery polka dot fabrics...they will be so fun to make into something awesome. A refreshing and happy post to brighten my day. This gives me an idea for my next blog post. Thanks! I love your pics. I am from adelaide and have very fond memories of camberwell markets. hope to get back there soon. Enjoy! Slippers, quilts & heaters make me happy too. I don't have a dachshund but the thought of one makes me happy. This post is too sweet..oh and those polka dots they make me pretty happy too. bummer I missed the market again! better scope it out in sydney! Polka dots always, always make me happy too. They are just so timelessly cute.